Mack is a 5’ tall human with silver hair and stormy blue-grey eyes. His life spent in the Yin-Sloth jungles have tempered him, giving him dark brown skin marred by several battle scars, including the loss of his left pinky – which is why his guitar’s strings are reversed, and he fingers with his right hand. 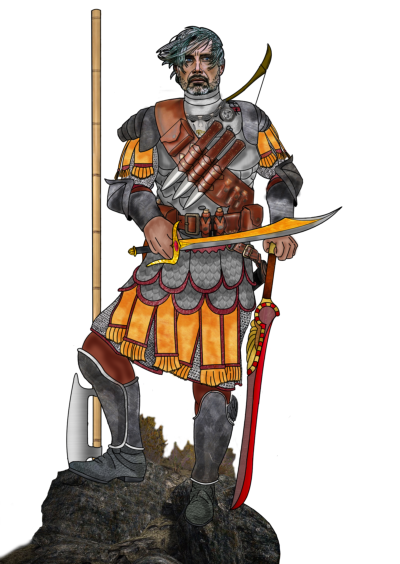 The saying, “Armed to the Teeth” was coined by a Raksasha, who faced him half a dozen times before finally falling, because when Mack goes into battle, he always has his Holy sword ‘Blood-of-Osiris’ and his Falchion drawn, a short bow slung across his back along with his Voulge, Quarterstaff, and quiver, with his two silver throwing daggers, ‘Life and Death’ in a holster on his chest, and two ‘Eyes-of-Horus’ gripped between his teeth, the other ten in holsters next to his daggers for easy retrieval. He learned early that you should only be naked when you enter this world and when you leave it. Never between. When he worked as a slave for the Orcish Empire, he learned the basics of Blacksmithing, and then apprenticed to a Monster Hunter Weaponsmith. He’s used those skills to fashion weapons and hone the skills to use them in battle. Mack is resurrected by The Man With No Name in his first use of the spell Athanasia. Short Bow 1D6 540 ft range. Eyes of Horus 2D6 4, Returning, Indestructible, Eternally Sharp, Silver. If “Pure” is said by the thrower when thrown, it bursts into holy flame. The magic fire inflicts 6d6, 9d6 against undead and animated dead. Can be activated 6x per 24hrs. Blood of Osiris 4D6+4 Sword, + 2 str/parry, 8D6+8 against Demons and Undead, Hilt is holy symbol, has Blinding flash, Globe of daylight, Liquid (any kind) to water, Circle of rain equal to a 6th level warlock. Each can be used 3x per 24 period. Roundhouse Kick 3D6 Once per melee round, o other kicks that round. Backward Kick None Knockdown attack. Cannot be parried. Flying Jump Kick 4D6 Same, counts as 2 melees. Pin/incapacitate Natural roll of 18,19,20. Held, neither opponent nor character can attack or move. Crush/Squeese 1D4 Double if over 8’ tall. Horse Kick Simul if rider rolls under second percentile horse. Front Kick 2D6+4 Simul if rider rolls under second percentile horse. Rear Kick 4D6+4 Simul if rider rolls under second percentile horse. Stomp 1D6 Simul if rider rolls under second percentile horse. Trample 4D6 Simul if rider rolls under second percentile horse. Bite 1D4+1 Simul if rider rolls under second percentile horse. Mounted Combat +1D6 damage to all attacks, +2 Dodge/Parry, +1 roll, +1 init. Armor of Ithan	 Touch/Target	 1 min/lev	 None	 SDC 100+10/lev AR 18 Fire, Lightning, Cold 1/2 damage. Decipher Magic	 Self 2 min/lev	 None	 Read runes, magic symbols, inscriptions at 94%. Not wards or circles. Sense Magic 120’	 2 min/lev	 None	 Diameter, near (w/in 20’) or far. Tell Person/object enchanted, in process of invoking magic, or magic used in area. Full Plate Worn A.R. 17 SDC 160. Medallion of Tranquility Neck Holy Symbol, if used on a victim of Vampiric control, they are saved from it, but become a mindless zombie while the medallion is worn by them. Medallion of Will Power Neck A special medallion that helps the undead hunter focus his will power to resist mind control and overcome adversity. The hero is impervious to the mind control of all undead while wearing the medallion ( + 6 to save even without it) and + 4 to save vs psionic mind control and illusions of any kind ( + 2 without the medal). By focusing on the medallion and the will to live, the character is + 4 to save vs poison and disease, and + 20% to save vs coma. Sets of clothing 3 Worn/Backpack Light cloth. It Breathes! Cloak 1 Worn Thick green cotton hooded cloak. No punctuation, but it’s right. Trust me. Boots 1 pair Worn These black leather boots were made… to inspire an overly-quoted and overly-played country song. Gloves 1 pair Worn Black Leather so that the hand print stays longer. Belt 1 Worn Heavy duty leather belt with an iron clasp. Can be used to punish. Dagger Sash 1 Worn Black leather sash strung across the chest with fourteen scabbards, 2 for throwing daggers, 12 for throwing stars. Backpack	 1 Worn Canvas backpack with pockets, can hold two and a half gallons of… stuff. Crow Quill Pen 1 Backpack Wrote the Ravenquillpen: Nevermore! Small Sacks	 4 Worn Canvas sacks, can hold 1 quart each. Tied on to belt with a cloth rope. Mack is a human slave, turned Monster Hunter, turned Orcish Singularei (meaning high-ranking personal guard) from the Yin Sloth Jungles, who has worked for years protecting the descendants of Doragon, including the current Orc Emperor, Orug. He was a young warrior in his tribe when the Orcish Empire was founded, capturing and enslaving them. He slaved for years under the orc’s rule, until he learned enough about the orcs’ customs and language to establish a free community outside of the notice of the Orc Overlords. He staged a breakout, and got his people to safety, but he stayed behind to work his way into the good graces of his Orc captors, to make it easier to help the slaves to remain hidden. He befriended his taskmaster, Thra’hall, and had mastered the customs and courtesies of Orcish Culture. In fact, he was close to becoming a full fledged citizen, with all the rights and privileges thereof. He learned of many gods, but the one he came to worship was Konesh, of the Pantheon of Ra. The writings of the other gods in that pantheon weren’t available to him, but he didn’t think he would need them. He converted whole heartedly. Unfortunately, he was framed by a competing, human-hating orc slave, for the murder of a captain of the guard, so he ran into the depths of the Yin-Sloth, steering clear of all those he knew, so as to keep their secrets safe. Within a month he had lost them, but he did not have the skills needed to survive the harsh environment. Hungry, beaten, and near death, he stumbled upon the Monster Hunter’s Water Temple, deep in the Yin-Sloth Jungles. He studied there for almost two decades, learning the doctrines of all religions, the Blacksmithing trade, and even apprenticing to a head Monster Hunter Monk. He converted to Horus, who seemed to mirror his core better than any other god in any other pantheon. After his time training, he returned to the secret tribe, but was chased off by them, afraid he’d bring the ire of the Empire down on them. He went to the now-retired orc taskmaster who he befriended during his days as a slave. The taskmaster pulled strings to get Mack into the palace guard, provided he posed someone else. He served three orc emperors faithfully, but the second one, Morbash, he failed, allowing him to be taken by a Tezcat Necromancer. He has lead several search expedition over the years to take down the villain. His second expedition would have ended with his death, if not for a wayward tribe of Kankoran who had left the Hinterlands for the undiscovered depths of the Yin-Sloth which matched their ideal of nature better than anything they knew in the Hinterlands. He was nursed back to health, and given the opportunity to perform the Rite of Passage, which was a sojourn to the foot of the mountains leading to the Baalgor Wastelands. He was allowed a single knife, and a single change of cloth clothes. It took him three months, as he had to trek carefully and silently through some of the most dangerous stretches in the known and unknown world. He put all of his knowledge and wits into action, and he came back to the tribe with a dozen weapons, all useful against one YSJ denizen or another. He had pouches of deadly toxins, sleeping poisons, healing salves, and rejuvenating powders. The Kankoran Scouts that welcomed him dubbed him “Armed to the Teeth,” in honor of his most feared foe – the Raksasha that tried on multiple occasions to assassinate Morbash before his abduction – and because his sojourn proved he would never be without a weapon. He returned to Orug, and told him he would take the warriors of his own choosing, and he would return with Morbash’s body. The last expedition he led consisted of 5 Undead Hunters, including Mack’s own brother. They were all captured by scores of undead, save Mack alone. He followed the beasts to their lair, and there met CrIsis. Sure of the futility of his quest from the tales of death and destruction CrIsis told him, Mack assisted CrIsis, leading them from the lair to the closest friendly city-state of Yin-Sloth. He enlisted the aid of some Undead Hunters to circumvent the Dragon infested lands, and saw CrIsis safely to the Sage’s holdings. Since, he brought the news to Orug, whose adviser, Grukag (the one self-same orc that tried to frame Mack before) tried to have Mack killed as a traitor of the Empire. Yet again, Mack fled. Skilled and powerful as he was, as influential as any in the empire save the Emperor or his closest advisors, he knew there was nothing but death if he tried to confront it all alone. As he left the Yin-Sloth Jungles for the first time in his life, he heard of the terror at the Millenium Tree. He set off like an arrow from a bow, to meet up with CrIsis and assist them.